Most people understand what a dentist’s general duties are because that is the dental professional most people see. Ever since they were young, they would visit the dentist every six months for their regular cleaning, exams, X-rays, and other treatments directly related to teeth. When they hear the word “dentist” they know what to expect. However, your dentist now has a periodontist in the office, and many patients aren’t sure what that entails in terms of treatment. To make things simple, your dentist wanted to provide a brief summary on how having a periodontist in the office can be very beneficial. In the end, it’s always meant to make your visits more convenient. A periodontist is essentially a dentist who pursued further education in periodontics. It’s very common for dentists to choose a particular field of dentistry to specialize in and practices prefer to keep dentists with these unique backgrounds available for patients who need their expertise. In this case, periodontists focus on the gums, gum diseases, and helping patients reverse and manage gum disease when possible. If your gums are pink, that means they are healthy and you’re taking the right steps to care for your oral health. However, if your gums are red, tender, swollen, or receding from your teeth, you’ll likely need a periodontist to help you treat your gum problems. After all, without healthy gums, your teeth won’t have a place to live. What Does a Periodontist Focus On? If these parts of your mouth aren’t healthy, your periodontist will be the dentist you’ll need to see. They are responsible for protecting the support structures of your teeth and making sure your jawbone, gums, and connective tissue are doing their jobs correctly. 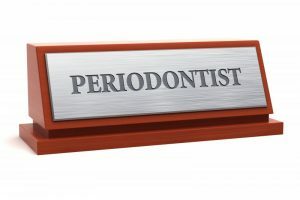 What Can I Expect at My Periodontist Appointment? Just like your routine dental checkup, your dentist will review your medical charts and most likely conduct an X-ray. This, along with whatever input you provide, will help them determine if there are any problems occurring in your mouth. After X-rays, they’ll perform a routine check of your mouth, jaw and gums and recommend any procedures if they think it will help you. Have more questions about periodontology? Schedule an appointment with your dentist today and meet the periodontist yourself! Dr. Brian Young attended the University of North Carolina at Chapel Hill to earn his Doctor of Dental Surgery degree. He then completed his specialty training on periodontics and implant dentistry at the University of Florida. Today, he’s a fulltime periodontist who’s ready to provide care to any patients in need. To learn more about his profession or practice, contact him at (904) 7321-9833 or visit his website.